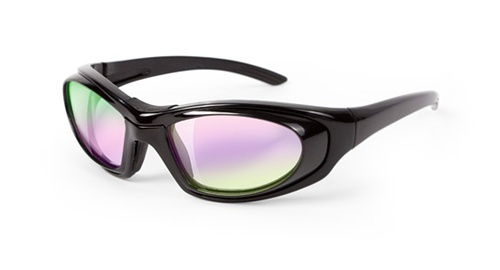 149-38-330 laser safety glasses are an light-weight comfortable sport warp frame with a glass laser filter. It is ideal for use in most laser applications and comfortable for long periods of wear. 330 laser filter was primarily developed for protection from laser wavelengths 532 nm and 800-10600 nm. These laser glasses may provide protection from other laser wavelengths not listed. Please see specifications for additional information about the frame and the filter, or contact us. This sport wrap frame is available in 3 sizes: kids/small, medium, large. Filter specifications are permanently engraved. Sport-wrap frame style with padded nose bridge. Side Shield protection with wide field of view. Kids/Small size has padded temples for added comfort. Copyright © ROBERTS EYEWEAR. All Rights Reserved.